← Smogelgem Revisited – Who is the legitimate heir? Reading this book was an exercise of mixed emotions, a lot of it was not new to me having grown up with Wet’suwet’en people and interacting with them as family, friends and coworkers. There is a lot one can learn about the people you live with by reading books like these as well. I would even suggest it would make great local classroom mandatory reading, but only in the higher grades where levels of understanding are better. As per my writing style, no holds barred let me warn you that people might be offended by what I write, to them I suggest, don’t read my opinion if you’re easily offended, get a copy of the book and read it yourself, your opinion is like mine, just an opinion. The one point I would make as an absolute, this book is not the law of the Wet’suwet’en people, but it does represent the rules they lived by in the recorded past or oral past, and is based on a number of issues, it is complex but not that complex most people would not understand it, even if its told to us that way, confusion is often intended to insure no one questions the powers that be. This book is a classic reaction by someone from the city, awestruck at how people live here now and in the past, especially how people survived the early 1900’s but today you only have to go back 50 years and we already see massive changes. Both in Wet’suwet’en lives as well as that of the locals of all nationalities who built this valley on the Bulkley River. The primary disappointment I had with the author was her incessant obsession with proving other historians wrong. I am sure she could have made her points without doing so at the expense of others. Maybe it was because it was not a true record of history, but rather a paid record intended to be used as evidence in court. Part of reading this book, will show you a past, that no matter how much some like living in the past, we do not want to go back there, and in many cases why would anyone want to go back there unless they were the ones in control. It was brutal, the obsession with warrior was all about brute force and killing, or protecting as in our understanding in the role of a soldier in active combat. Let me give an example of the past that might explain the issues between the Wet’suwet’en and the Wet’suwet’en Matrilineal Coalition. To a degree the book explains sexism and male dominance at the expense of women. Likewise the recent claims they publicly made about respecting women is contradicted in this book “Eagle Down is Our Law” Let us give you an example we shared below. Antonia Mills explains slavery in a more modern context, as within the last 100 years. This is an example of impossible to go back to, who would want this today? “Within the last hundred years there were also a few slaves people who did not belong to any Wet’suwet’en house and who had access to territory only with suffrage of people with land, such slaves were outcasts or peace bonds with neighboring peoples. They often played an important role as they learned a second language and became interpreters between the between their former people and the Wet’suwet’en. Yet we have witnessed how pink salmon are being kicked around like soccer balls during harvest season, likewise how often we have seen nets of rotting salmon on the Bulkley River. We agree that Wet’suwet’en’s do not approve of this happening, but little if anything was done when it did happen. Almost every year nets full of fish are rotting alongside highway 16, not necessarily in Wet’suwet’en territory. The sockeye in the Morice are on endangered species lists, yet they are being sold in Smithers, again the majority of Wet’suwet’en obey the law, but those who are the law, do little or nothing about it. “Ron Mitchell: Fisheries and rangers. There a couple of charges pending with our fisheries and DFO are encouraging our rangers to charge them. We won’t charge our own people. We will not have rangers charge our own people. The government is using our rangers to have our people charge one another. That is something to think about.” Laksilyu clan meeting 2009. We run into this double speak all the time, the rule for one, does not apply to another, one Wet’suwet’en told me in humor, it depends on where you are on the totem pole as to what rule applies and when it applies. Our point here is not to highlight the sins of some Wet’suwet’en, our purpose is more to prove the point of the absence of application of Wet’suwet’en law, and that the law is being used as a political football by the power chiefs in Moricetown, we also refer to them as the Wet’suwet’en Five. I want to make it clear that most Wet’suwet’en pride themselves as being honest and hardworking people, and it’s what is known in working circles as the politics at the top, where all the problems originate. In the past anyone non aboriginal that who dared to talk about issues like this were immediately labeled racist. It was a way to force Wet’suwet’en citizens to be on the side of the chiefs at the top, or the side of the colonizers. A gimmick that worked for a number of decades, but today is falling apart very quickly. By agreeing with anyone opposed to the chiefs at the top you were labeled an apple or a traitor to your own people. Likewise with the issue of hunting on only your territory, there are so many people who know this practice was not being followed by the residents of Moricetown in regards to clan territories, even cases where whites hunted with them, it was on the premise of what they do not know won’t hurt them. Control by a few old men, yes they wear blankets, and have respect as elders, but do they have respect in regards to being fair to all Wet’suwet’en people? Is this the past you yearn to go back to? 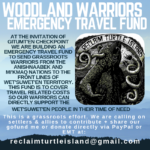 As evidence in the video blow, is just how serious the concern is that they do not have the support of the Wet’suwet’en people, so much so that they demand the cameras be turned off in order to hide this evidence. We believe that the 5 chiefs no longer have the moral mandate to represent the Wet’suwet’en people. More evidence of that will occur at a massive rally in Houston this coming weekend. No wonder the Wet’suwet’en who live outside of the centralized power group in Moricetown (Witset) and Hagwilget, prefer to stick with both democracy and not use the chiefs there as their means to negotiate land claims. They chose the Carrier Sekani Tribal Council a democracy to represent them, even though they belong to the same clans and are as legitimately Wet’suwet’en as are the chiefs from Witset. I can fully understand why those who are hereditary chiefs in power and head chief or wing chiefs would want to maintain this monarchy. This type of monarchy is one where the sovereign (King or Queen or FN Chiefs) has, in theory, total power also known as power absolute. In a more European concept, yes those who were Lords, Knights, and Noblemen, or the kings, queens, princes or princess would also enjoy the benefits of living in the past, however would the rest of us wish to return to being their serfs and slaves? Not Likely. The problem is you cannot run an empire without someone doing the grunt work at the bottom, thus the poor remain poor and the rich get richer. Antonia Mills also covers in quite accurate detail how the rules or Wet’suwet’en laws have evolved, in particular during more modern times. I do not mean to be crude, but it sort of works like this, the hereditary chiefs agree on something, or better put the most powerful chiefs agree on something, they put it to their people, who are already submissive and must never oppose the chief above them. The law or rule is brought into a feast hall, where it receives the official status of a carried motion in front of all the people. In short “Eagle Down is Our Law” is no definitive law, it’s as fluid as the opinions of the most powerful chiefs. Names are big business, you have to have a lot of money, to get both name and territory. Today that’s translated into thousands of dollars for family to pass on names, or simply to pass on inheritance. The same territories today could be worth hundreds of millions, if you have a gold mine on your inheritance. But that would all flow upstream to the top, no democracy, just 5 clans cheifs deciding on who gets what. Not the clan’s members, the chiefs at the top, so it comes down to always making sure your chief loves you, in blunt terms, we use the word in the workplace called brown nosing. No wonder so many Wet’suwet’en want to choose democracy over inherited power. Still there are those who are not ready to give up that system, and I can respect that, they put a lot into learning and following traditions, they invested so much time, and money and effort into maintain it. Somehow Antonia Mills seems to have left out the effects of residential schools, alcoholism, broken homes, the 60’s scoop, and how much of the system had to be reborn, with very little references, leaving 100% of history in the hands of a few people. All based on you can take my word for it. Antonia Mills does note that the sons and daughters of the head chiefs make advancements much more rapidly than other children. The history shows that he who donates the most towards a feast also gets rewards in terms of status and power. Injecting my own view here, imagine someone with little to no income, getting a job for white man at 50 dollars an hour, and saves for a year, that can buy him a lot to put towards a feast, while a single struggling mother of 3 or 4 children depend on welfare for survival can not afford anything. Look at the Wet’suwet’en logging contractors who operated out of Moricetown, they could afford to become the chiefs we have today, they had lots of money. The book is very clear that feasts are big business. No matter what culture you study, history has both stories that are shameful, and those that give us pride, as many wise men would say, you had to be there to understand. History is all about those who sacrificed and those who profited from others sacrifice. The mix of modern day culture, instead of kids learning out in the bush, they now all have the latest electronic toys, it’s a new reality, not just for non-natives but also for the Wet’suwet’en peoples. They are not alone, I grew up in the woods and mountains, my kids are like everyone else’s kids today, no respect for the past and on electronic devices from breakfast till supper. The chapter regarding Wet’suwet’en laws covers a wide range of issues, a lot of what modern society would call folklore or legends, to dealing with the violent deaths of both guilty and innocent participants. These laws on killing other humans, even if it was restricted to First Nations only would not go over to well in today’s society. One might say it’s a rated R chapter, not anything the Wet’suwet’en children would want as their future. Even as we speak today there are numerous wanted posters of First Nations members, Wet’suwet’en included, regarding murder or the taking of another First Nations members life. This woman has as I said shown in her records that in the last 100 years the laws themselves are changing and do so at the edicts handed down by the chiefs, not the lower chiefs, but the heads of the 5 major clans. Again it refers to the head chiefs as “power absolute” meaning that whatever they decide, it must be done at a feast, then it becomes absolute law. One burning issue this book does NOT resolve is the stripping of title of head chiefs, no record of such exists. We have asked that before, how is it possible that a hereditary chief of the same level of jurisdiction can strip another of their power, or property, it’s theft in our humble opinion. Unless you enter one more variable, that variable is female hereditary chiefs hold no power or say, can be the only explanation, and could explain why nobody dares to admit the real truth. I hope I am wrong, but reading actions speaking louder than words, that this is the actions that took place. Likewise taking ones name away, like Smogelgem, and giving it to another house clan, violates every rule of previous history in regards to laws in this book. A great injustice has been done, and by Wet’suwet’en law, it must be compensated. No such precedent ever took place in Wet’suwet’en, unless it’s in yet another book. 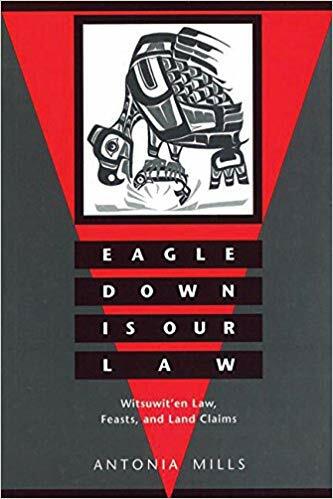 The book “Eagle Down is Our Law” in itself proves that this is the end of an era, because we cannot go back in time and apply the laws of the past to today, the Wet’suwet’en people themselves would never tolerate it. There are many laws I have not referred to in this book review, that if applied would land the persons applying it in jail. I will give one such example, if a woman is having menstruation for the first time, they cannot drink water from a river, eat fresh meat, or even look at a mountain. Imagine trying to impose that on young women today? The past is the past, every nation in the world has strange rituals attached to their past, but they are left behind, like our ancestors, they are part of their past, and have no place in today’s world. We belong to this earth, like our ancestors, we do not own the earth, it owns us, and we return to the earth, we cannot take anything with us. The book does nothing to explain why there are such great divisions between Wet’suwet’en people, but it does show that in front of a guest historian, they sure do not talk about it, even though we are very very aware of its existence since the 60’s. The author went out of her way to point of the rifts between white man and aboriginals, yet covered up the differences between Wet’suwet’en nations as if they do not exist. I find the slanted view disturbing, and appears to me as patronage to her employer. I do not want to go into too much detail in regards to all of what is said in the book, I do not want to be the “spoiler” of a book that everyone genuinely interested in the culture of the Wet’suwet’en people should read. I most certainly can only be an observer, relate my opinions, that others may differ with, even rightfully so, my observation is that now we have many Wet’suwet’en elders, caught between two worlds, the world they grew up in, the laws that applied to them, the world they respect and the laws they respect, vs a new world, a new generation, where kids no longer want to live in the past. That overlap, of those who want the past to stay, the laws and rituals, are clinging to the past, rightfully so, however equally as right and just is those who want to enter the modern world. So history will determine the fate, time will be on the side of our children. Then we have also a third group, that group wants the past present and future, they want all the rights of the past, not the responsibilities, and want all the benefits of the future. We fully understand the fascination many Canadians have with the past of our aboriginal people, sadly we also see the push by American funded Canadian environmental groups using money as cattle prods to have aboriginals under the guise of protecting the land stir up trouble on behalf of their agenda. 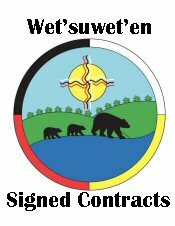 I suspect most Wet’suwet’en people already know the real meaning of Wet’suwet’en Law is the unchallenged voices of the Wet’suwet’en Five. The feast is the equivalent to a public courthouse, where laws are made, depts. are paid and there the “power chiefs” make all the rules. It’s not democracy, it’s never in the best interest of the people, it was the law of the past, and it does not have to be the law of the future. I am not surprised by the connections with religion and power chiefs as well, the British monarchy did the same my replacing the Catholic Church with its own version, Anglican so religion would not contradict this throne of power. In the closing chapter Antonia Mills argues the point, about the DIA controlling Moricetown by way of elected counsels, referring to comments made by an elected chief, Wigetemskol serving 12 years in that position, and quotes his position in support of all clan feasts, and mentions how that government system was being used to assimilate the Wet’suwet’en. I could not, and will not disagree, however a much more important observation is missing, in that the head chiefs here pretty much only represented Moricetown and Hagwilget, in this book, there is a complete absence of mention of the existence of other Wet’suwet’en tribal councils. It’s not possible that she did not know of their existence, so I am sure that this is part of hiding the great divide. Thus I can only conclude that this book became what it was paid to be, that of the voice of the people who hired them, it’s not wrong, its natural, but it’s also telltale that there is much more going on left untold. This is about land, power, control, by a very limited amount of people, 5 families, who want 100% top down control of all Wet’suwet’en people and land, unfortunately for the Wet’suwet’en Five a growing number of Wet’suwet’en people disagree. It’s time to stop flogging “Eagle down is our law” “it was your laws”. Considering this “Eagle Down” is a means to give the heads of 5 clans, power absolute, over all Wet’suwet’en people, clearly the people have reason to disagree. Eagle down may well remain Wet’suwet’en law for some, but the book definitely proves there are no concrete laws, other than as per what I described earlier regarding feast halls. In SD#54 (Bulkley), the mandatory classroom reading for Wetsuwiten is the book produced by the school district. It is called “Niwhts’ide’ni Hibi”it’en- the ways of our ancestors”. Witsuwiten history and culture throughout the millinnea- by Melanie Morin. A fantastic read, available at most book stores and libraries. Documents all history, including any disagreements in house groups. The Morin book shows the hereditary line of succession for all house groups and shows that Gloria George is the Hereditary Chief Smogelgum for the Sun House. Many documented stories/people from across the territory in the book, not just the witset group. The Morin book is a true reflection of the culture and people, I highly suggest people read it! I was always taught that it isn’t about how much money or goods you can contribute in the feast hall it is about being there for your clan and supporting them when they need it.